The dreary weather is as sombre as our destination. We’re bound for the northern Taiwanese town of Jinguashi, more particularly its monument to Prisoners of War. With the Pacific Ocean disappearing in the rear view mirror we ascend the snaking, twisting mountain road into the Ruifang District. We pass a procession of ramshackle huts clinging to the shoulder. Beyond the bitumen’s pitted edge the land drops away steeply into vegetation-clad slopes slushy with mud. The higher we ascend, the heavier the rain becomes. Long after my ears have popped we pull into the town of Jinguashi. 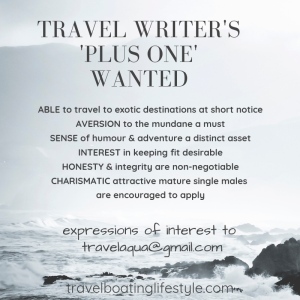 With the rain persisting, our waning enthusiasm for exploring is about as damp as the bilges of the Titanic on her maiden voyage. With over 200 peaks that rise above 3000 metres, the Chungyan Mountain Range (or just simply Central Mountains) acts as a sort of ‘rain magnet’ dumping on average 2.5 metres of rain per year. Much of that seems to have fallen on the day we’re here. But my own sodden misery is inconsequential compared to the deplorable suffering of those interred here 70 years ago. After the surrender of Singapore to Japan in 1942, the Japanese (who had occupied Taiwan since 1895), started bringing Allied FEPOW’s (Far East Prisoners of War) to Taiwan to use as slave labour. Kinkaseki POW Camp stood on the side of the mountain, its location chosen thanks to its proximity to a copper mine. Though, in reality, I discover that the camp wasn’t actually located particularly close to the mine. POW’s were forced to march further up the mountain behind the camp before descending to the depths of the mine where they slaved in appalling conditions. Day after day after day. Looking around at the sodden scene I can barely comprehend the extent of their misery. 523 FEPOW’s were interred at Kinkaseki POW Camp. Many of those were Australian. Most suffered enormously. Some never made it home. The camp operated for three years before being shut down when no longer ‘viable.’ Surviving inmates were despatched to other camps spread around Taiwan. Sculpture titled ‘Mates’ by Wu Jung Fu memorial to POW’s captured and interred at Jinguashi by Japanese in Taiwan during WW2. Almost 20 years ago the Taiwanese people set about honouring Commonwealth and Allied prisoners. 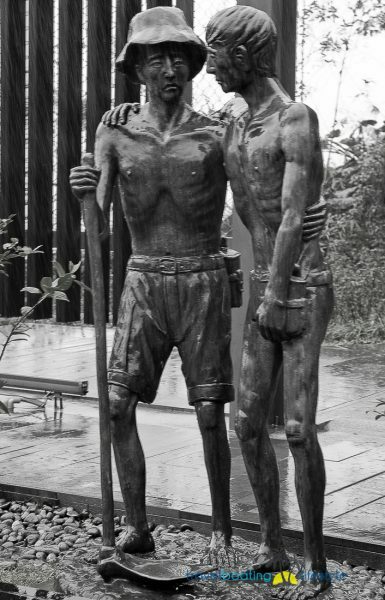 A moving memorial depicting two men, arms around each other offering support, now stands at the former Kinkaseki site. The striking sculpture offers a focal point for relatives who come to pay their respects. I wonder if it the memorial was deliberately designed to be devoid of any shelter from the rain. As I pause to reflect on those who were interred here, water cascades down my own face, just as it does on the cheeks of these two bronze men. Nearby, an intriguing display at the Gold Museum in the former Taiwan Metal Mining Corp offices offers some insight into just how treacherous underground mining was 70 years ago. Alongside POW history and mining, there’s an imposing 220kg gold ingot on display. It’s a popular Insta-worthy site where visitors clamber to have photographs taken stroking its golden sheen. The same terrain that is pitted with tunnels and mines that caused such grief for POW’s, now attracts visitors for its raw beauty. The grand Shifen Waterfall is Taiwan’s broadest waterfall, dropping from a tributary of the Keelung River in a tumultuous cascade. Clinging to a mountain slope, the historic gold mining town of Jiufen retains a quaint, picturesque charm that attracts artists, filmmakers and photographers. On a clear day I’m told the Pacific Ocean can be seen in the distance, dotted with fishing trawlers. But not today. 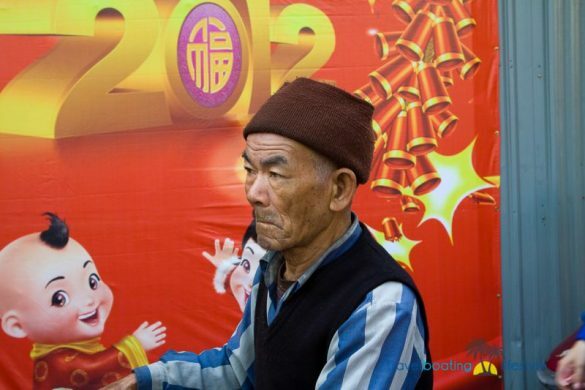 Further inland, residents of Pingxi have made good use of their high annual rainfall. 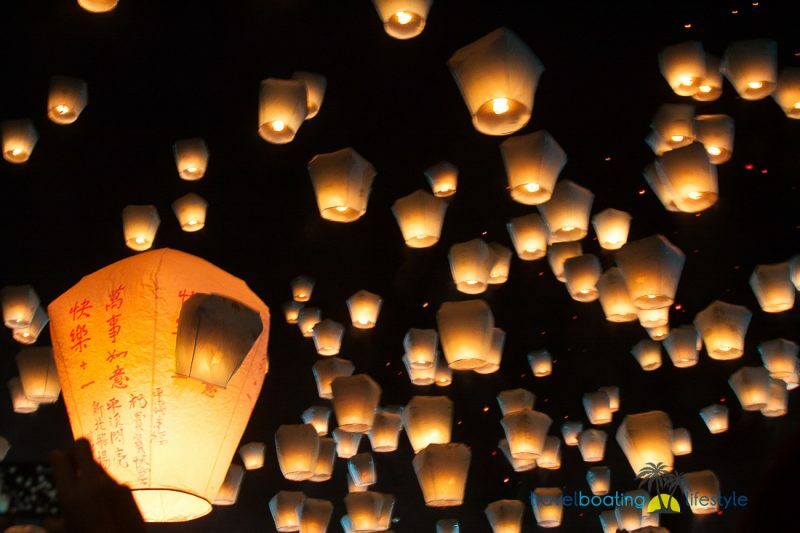 Pingxi is the only official location in Taiwan where flaming sky lanterns can be launched. Presumably the consistently damp terrain acts as a nature fire retardant for wayward lanterns. 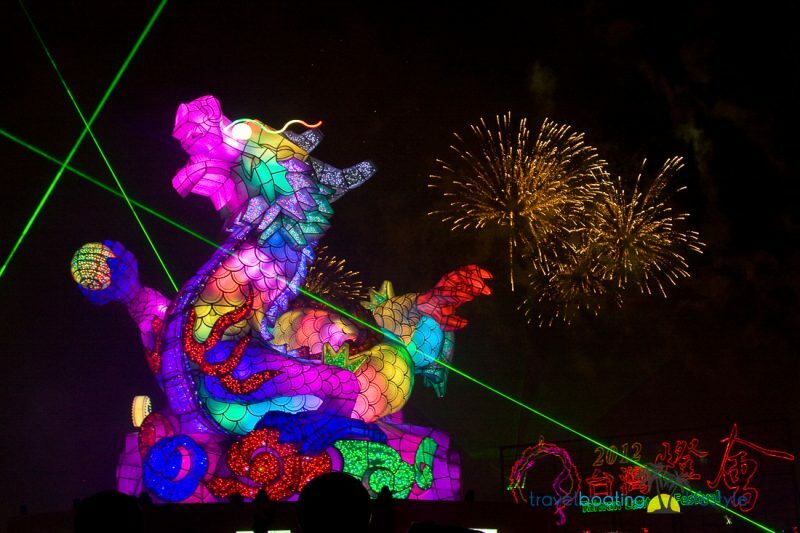 During the annual Lantern Festival (held during Chinese New Year celebrations) Pingxi is swamped with visitors. One of the main attractions is to decorate paper lanterns with wishes for luck love and prosperity before releasing them to the Heavens. 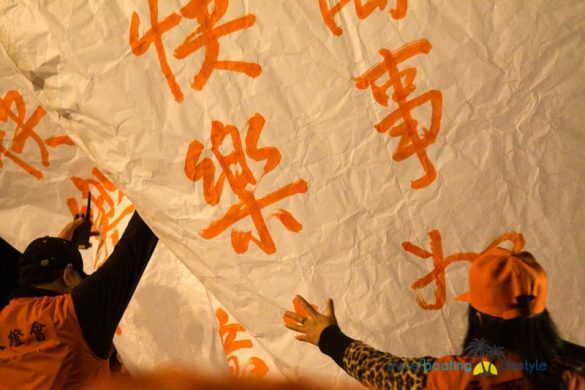 It’s a festival steeped in tradition going back hundreds of year’s sky lanterns have been released in spiritual celebration. Releasing my own lantern blessed with wishes for love and happiness, I get surprisingly teary as I watch my flaming lantern join the throng skywards. Pingxi is accessible by rail from Taipei. 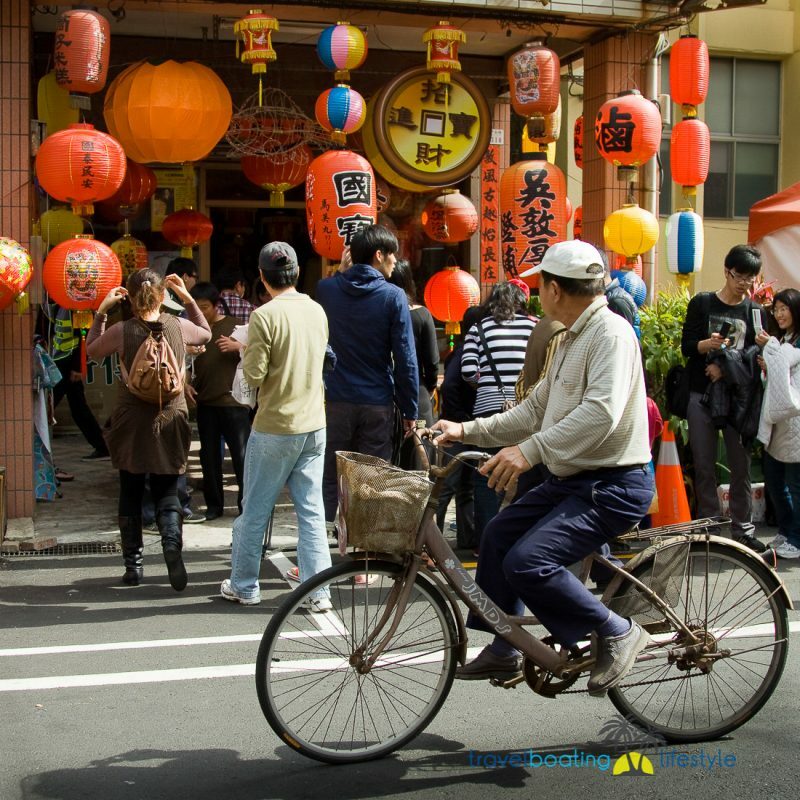 During the Lantern Festival the town transforms into a vibrant, pulsing street festival with laneways and streets clogged with festival goers. Street vendors and lantern sellers do a brisk trade. 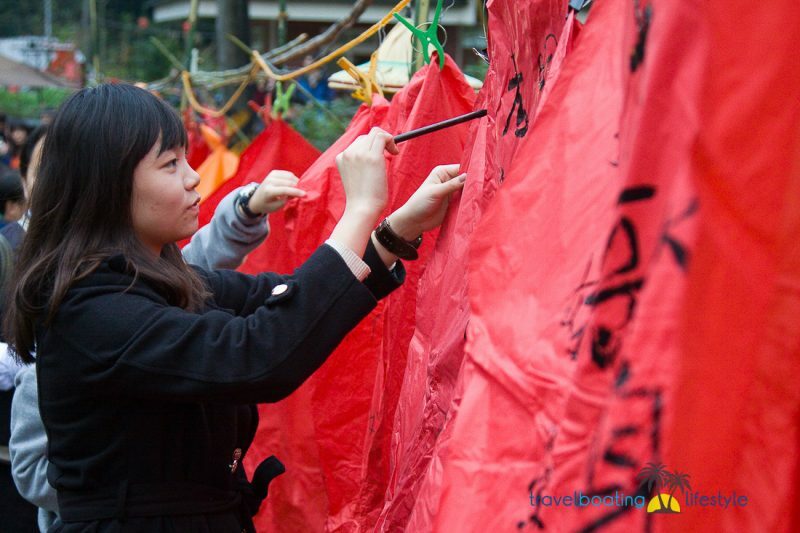 Though figures are rather vague, it’s estimated that over 50,000 flaming sky lanterns are released during one day. While overhead the sky is dotted with flaming lanterns, down at street level the air is filled with aromatic steam rising from dumplings piled up in bamboo steamers on vendors’ carts. 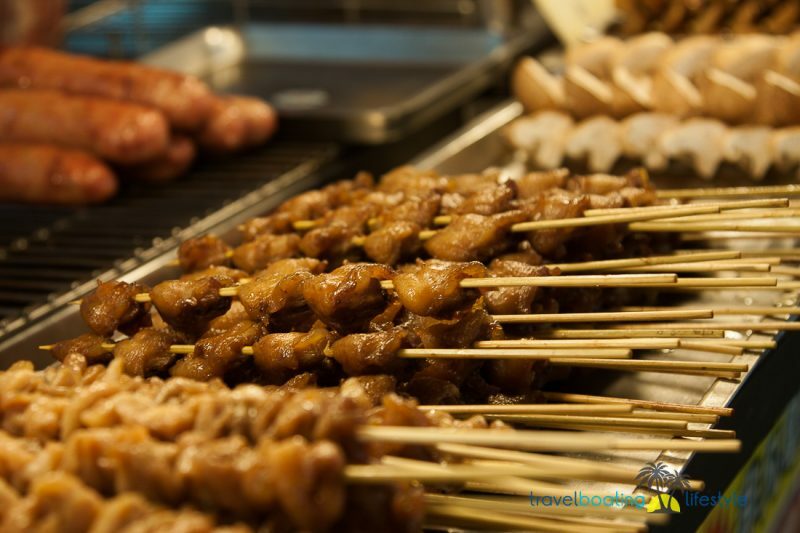 Taiwan does street food exceptionally well. It’s always cheap and plentiful, and when washed down with Taiwan Lager makes for a terrific meal. 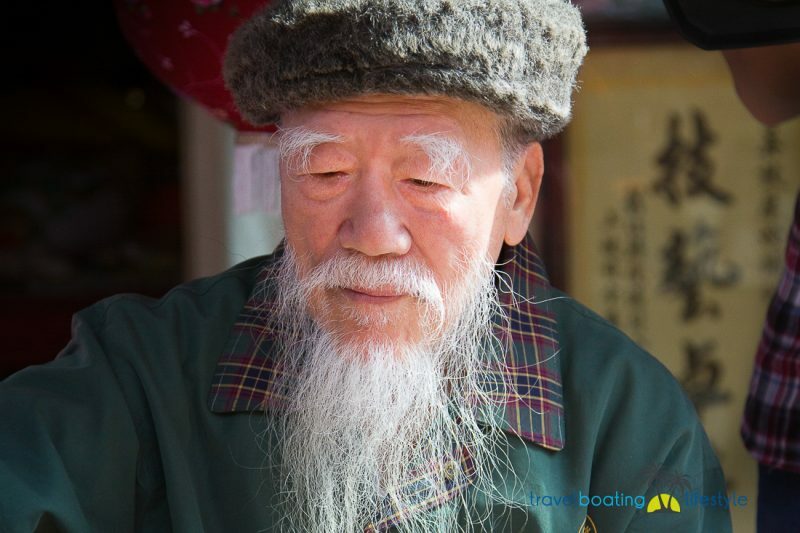 Chinese heritage has a strong influence on Taiwanese life, with almost the entire population Han Chinese to varying degrees. 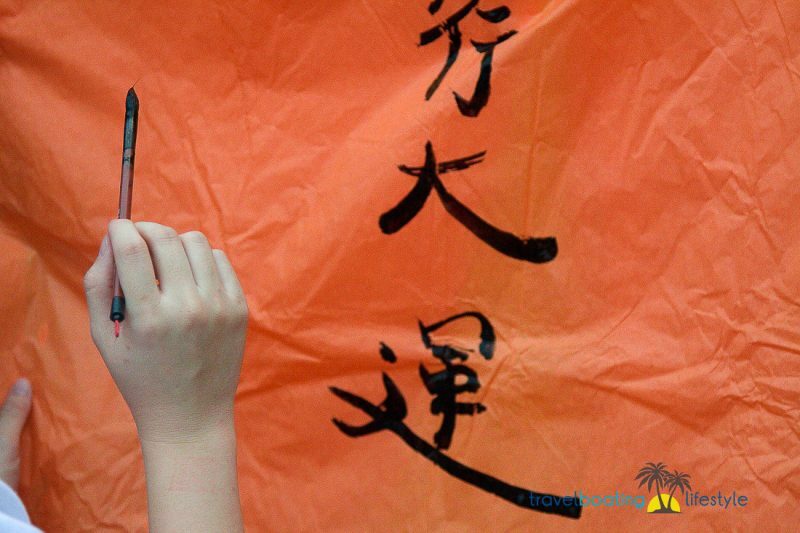 Though, being an island nation, Taiwan has always been vulnerable to other Asian influences. It was under Japanese occupancy for 50 years until 1945. Taiwanese are a rather resilient lot though. Erecting a memorial to atrocities that were committed on their soil during WWII is an important step in assisting old wounds to heal amongst neighbours across the Asia Pacific region.